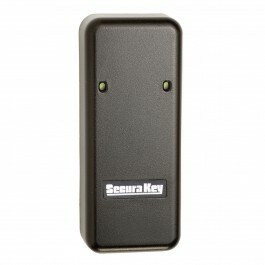 A contactless smart card and key tag reader, the ET-SR-X-R is the next generation in Secura Key technology. UL 294 listed and FCC/CE approved. The ET-SR-X-R Directly Replaces The Older Model ET8-SR-X-M.
A contactless smart card and key tag reader, the ET-SR-X-R is the next generation in Secura Key technology. This reader features a solid state relay for controlling door strikes and other devices as well as four inputs to monitor contact closures. Designed for use with e*Tag cards, this versatile smart card reader is also capable of using a variety of other name-brand cards and key tags. UL 294 listed and FCC/CE approved. The ET-SR-X-R is also available in a conveniently bundled kit with the new NOVA 16, enclosure, 4 of these readers, a power supply, as well as the SK-NET desktop software. Size: 4.38" x 1.74" x 0.9"
Epoxy-potted - Great for outdoor installations!